Xduino v0.31 has been released. This release include STM32f10x required libraries as well as project example file for Keil RV-MDK and IAR EWARMv5. Minor change has been done for serial port buffering to make sure that buffering is done seperately for each serial port. All Arduino syntax are compatible with Xduino v0.3 (as per Arduino references and Arduino extended references page except for analogReference() command. There are total of 5 serial ports so Serial1-5 commands can be used. Mathematical functions are included. For full information please check this math.h page. Standard library functions are available. For full information please check this stdlib.h page. Other C and C++ libraries can also be included, extending the limitation of functionality. All Analog input and Analog output channels have 12-bits data. This means that when reading analog channel by using analogRead() command the returned value is between 0 and 4095 and when writing to analog output channel one can write value 0 and 4095. There are total 16 interrupt channels for digital input pins, the interrupt. Each pin ‘number’ can only be assigned an interrupt. This means that interrupt cannot be assigned to PA5 and PB5 at the same time as the pin ‘number’ is the same. Generally the use of delay functions are not possible within the interrupt handling routine and this is where pause(ms) and pauseMicroseconds(us) comes in. Just specify the number of milliseconds/microseconds to pause the program and pause will handle it even within the interrupt. Note that pause only “approximate” the time to delay. Finally Xduino version 0.3 has been released. 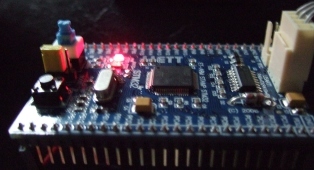 This version has all Arduino platform functions except for analogReference() function. On top of the the above, Xduino have taken a step further by extending the functionalities above and beyond current scope. For more information please check the Documentation section. This version also includes Keil RV-MDK project file example.